Travel as a Group on a Life-Changing Adventure, from Summer Camps to Study Abroad Opportunities! There is no better way to build cultural awareness than to travel. 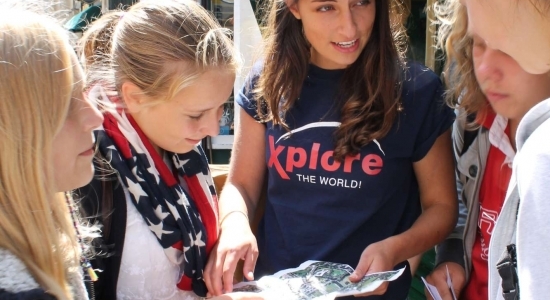 Check out the opportunities that Xplore offers for groups! Spend 2-5 weeks in Europe this summer, create your own customized group travel experience or embark on a homestay immersion program. We offer a wide range of programs for groups, focusing on language development, leadership, sports, exchange and intercultural friendships! Customized tours for school groups, youth groups and sports programs. Xplore is proud to offer a wide range of options for customized tours for school groups, youth groups and sports programs. Programs are completely customizable to fit your groups’ interest and needs. Center a program around academics, tourism, sports or the arts. Combine a tour of European cities with a language immersion experience, a summer camp or a homestay option. The possibilities are endless. Xplore offers a wide variety of summer camps for groups. Held throughout England, Germany and Italy, we have a camp for every student’s interests and needs – from sports focused camps to those focused on leadership skill development – there is something for everyone! Xplore’s team helped take the stress out of traveling with my students. They were so flexible and great to work with and created a wonderful tour of England for my history students. Would definitely recommend. Explore the streets of Berlin, the museums of Rome and the gardens of France. With partners across Europe, Xplore offers unique travel opportunities to most of Europe’s most popular destinations. Learn about opportunities to travel to France, Spain, Italy, Germany and England. Not only do we offer the opportunity to visit famous landmarks and historical sites – ask about how you can integrate real, local cultural experiences, language immersion and school tours – paired with residential camp experiences with other students from around the world.